We built a better premium travel card. $400 annual fee; $75 for each additional card. Triple points for travel and mobile wallet purchases. While on the go, keep things simple. Earn an industry-leading 3X points per $1 for eligible net travel and mobile wallet purchases with your Altitude Reserve Card.2 With accelerated point earning, every purchase gets you closer to your next getaway. 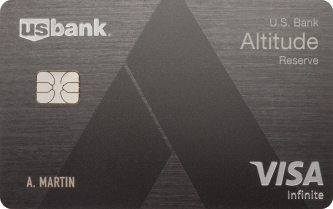 Powerful earning potential with a custom-engraved metal card. 50,000 points can be redeemed for $750 in airfare, hotel, car rentals and more. Not a customer? Visit a branch to speak to a banker.